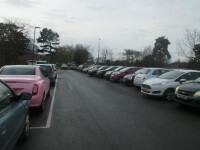 There are 14 car parks located around the campus. For more details on parking on campus, please see the St John's Campus web page. Related link St John's Campus Web Page. 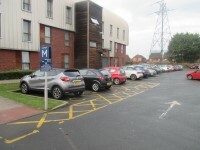 You are on Shared Section (Parking (Car Park A Short Stay and Visitors)). Skip to the next section. 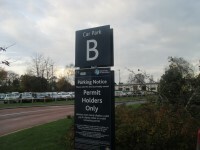 You are on Parking (Car Park B). Skip to the next section. 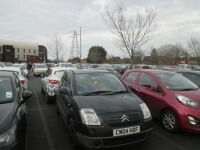 The car park is located to the right of the Peirson Centre. 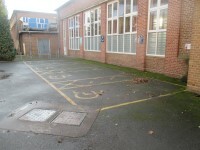 The dimensions of the designated parking bay(s) are 440cm x 550cm (14ft 5in x 18ft 1in). The nearest designated bay is 16m (17yd 1ft) from the out of hours entrance - Peirson Centre. 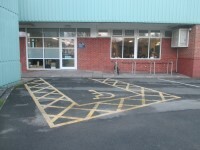 The furthest designated bay is 56m (61yd 9in) from the out of hours entrance - Peirson Centre. 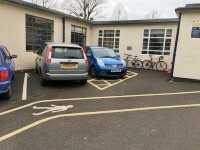 The car park is for permit holder only. 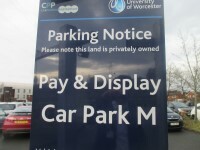 You are on Parking (Car Park C). Skip to the next section. 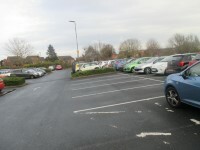 The car park is located to the side of Woodbury, opposite the Pierson Building. 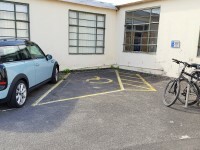 The dimensions of the designated parking bay(s) are 300cm x 410cm (9ft 10in x 13ft 5in). The nearest designated bay is 10m (10yd 2ft) from the Woodbury side entrance. The furthest designated bay is 17m (18yd 1ft) from the Woodbury side entrance. 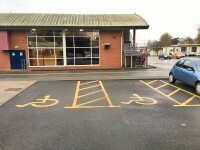 This car park is pay and display and permit holder parking. 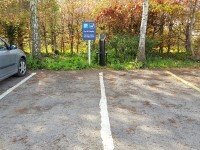 This car park contains an electric car charging point, next to the Blue Badge Bay, directly opposite the entrance to the car park. You are on Shared Section (Parking (Car Park D)). Skip to the next section. You are on Parking (Car Park E). Skip to the next section. 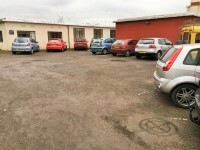 The car park is located at the front of the Woodbury Building. 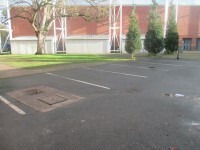 The dimensions of the designated parking bay(s) are 400cm x 500cm (13ft 1in x 16ft 5in). The nearest designated bay is 6m (6yd 1ft) from the Woodbury main entrance. 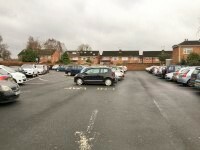 This car park is for permit holders only. You are on Parking (Car Park F). Skip to the next section. 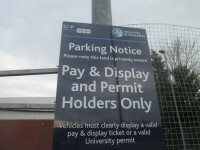 The car park is located at the front of the Thomas Telford Building. 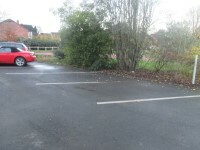 The dimensions of the designated parking bay(s) are 320cm x 430cm (10ft 6in x 14ft 1in). The nearest designated bay is 10m (10yd 2ft) from the Thomas Telford main entrance. 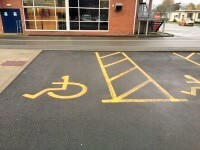 The furthest designated bay is 13m (14yd 8in) from the Thomas Telford main entrance. You are on Parking (Car Park G). Skip to the next section. 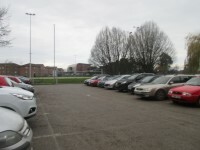 The car park is located between the Edward Elgar and the Binyon Buildings. 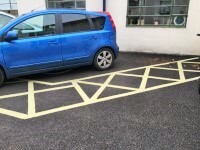 The dimensions of the designated parking bay(s) are 350cm x 440cm (11ft 6in x 14ft 5in). The nearest designated bay is 9m (9yd 2ft) from the Binyon Building main entrance. 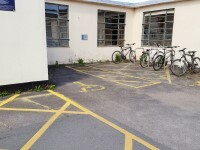 The furthest designated bay is 20m (21yd 2ft) from the Binyon Building main entrance. The maximum height is 260cm (8ft 6in). 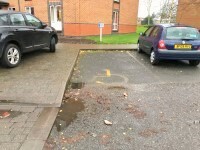 This car park is for Blue Badge and permit holders only. You are on Parking (Car Park H). Skip to the next section. 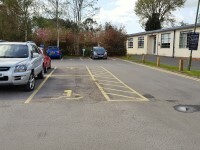 The car park is located on the left hand side of Bredon from the main entrance. The nearest designated bay is 65m (71yd 3in) from the Bredon car park H entrance. 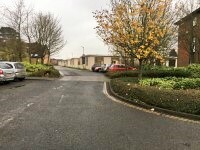 The drop off point is located at the car park H entrance. The drop off zone has a 10 minute maximum wait time is marked as nursery use only. You are on Parking (Car Park J). Skip to the next section. 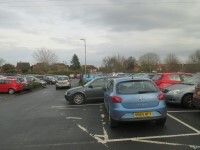 The car park is located to the rear of Bredon. You are on Parking (Car Park K). Skip to the next section. 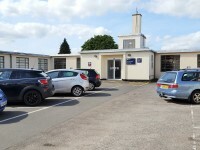 The car park is located in front of the Bredon main entrance. 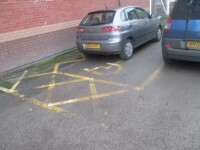 The dimensions of the designated parking bay(s) are 352cm x 436cm (11ft 7in x 14ft 4in). The nearest designated bay is 6m (6yd 1ft) from the Bredon main entrance. 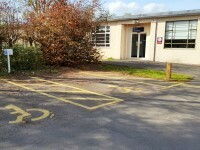 The furthest designated bay is 9m (9yd 2ft) from the Bredon main entrance. You are on Parking (Car Park L). Skip to the next section. The car park is located to the right hand side of Bredon. 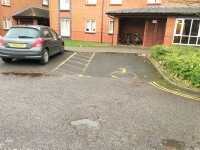 The dimensions of the designated parking bay(s) are 250cm x 420cm (8ft 2in x 13ft 9in). The nearest designated bay is 48m (52yd 1ft) from the Bredon Car Park L entrance. 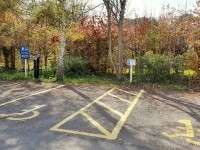 The furthest designated bay is 92m (100yd 1ft) from the Bredon Car Park L entrance. There a 4 small blue badge bays available. The dimentions provided are for theses. There is one larger Blue Badge bay available that is 340cm wide and 410cm deep. You are on Parking (Car Park M - Long Stay). Skip to the next section. 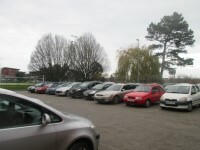 The car park is located behind the Elizabeth Barrett Building of St John's Halls. 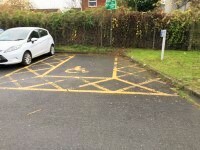 The dimensions of the designated parking bay(s) are 360cm x 560cm (11ft 10in x 18ft 4in). The nearest designated bay is 22m (24yd 2in) from the St John's Halls - Elizabeth Barrett Browning 1-6 Entrance. The furthest designated bay is 29m (31yd 2ft) from the St John's Halls - Elizabeth Barrett Browning 1-6 Entrance. You are on Shared Section (Parking (Car Park N)). Skip to the next section. You are on Parking (Car Park R). Skip to the next section. 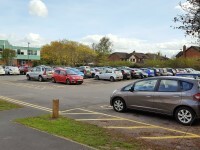 The car park is located to the right of the Sports Centre. 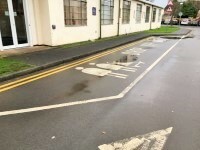 The dimensions of the designated parking bay(s) are 375cm x 540cm (12ft 4in x 17ft 9in). The nearest designated bay is 44m (48yd 4in) from the Binyon Building entrance. 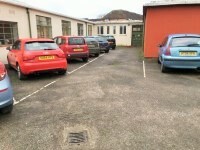 Spaces on the right of the car park are car share only until 10:00. 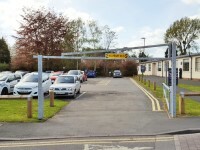 The car park is pay and display and permit holders only. 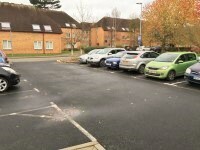 The St John's campus has 3 assistance dog toilets, one to the side of Woodbury, one between the Thomas Telford Building and the Pershore block of the St John's Halls Standard Accommodation, and one between Bredon Building and Evesham block of the St John's Halls Standard Accommodation.